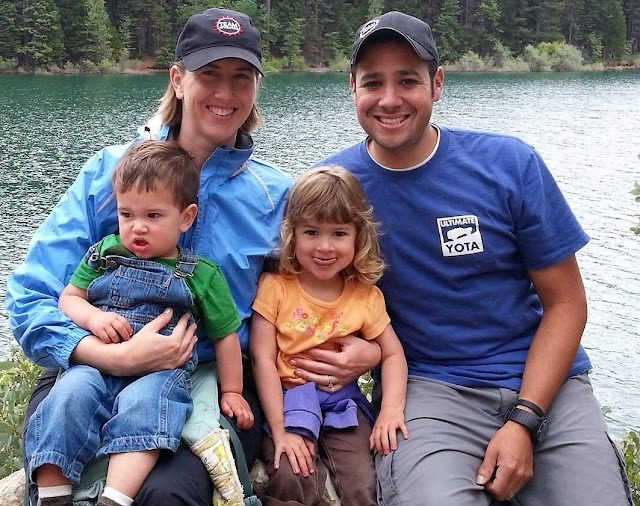 Mike with his wife Marin, along with their two children. Mike Meza is 34 years old, and a Water Resources Control Engineer at the State Water Board's Division of Water Rights. Getting his exercise, better sleep, less stress, and saving around 10,000+ miles per year in auto miles makes this committed cyclist a shining example of how biking, health, and sustainability work together. 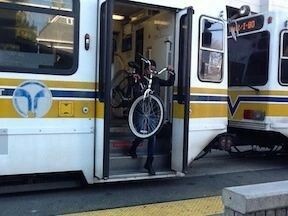 On most workdays-rain or shine, hot or cold, you will find Mike taking Sacramento’s light rail with his bike to his Downtown office. His morning commute on the train begins at 6:30. At this time, the ride is pretty comfortable, with the stations being easy to access, along with bikes being welcome on board. On most mornings, there are a few bikes in each car. In the warmer months - and especially during May, which is "Bike Month," there are quite a bit more. 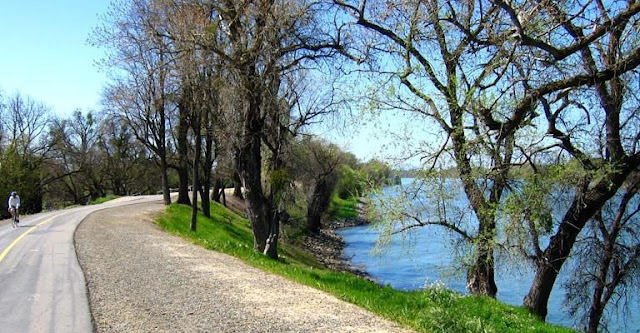 After work, he bikes home; starting in Downtown, then travels the American River Bike Trail toward his home in Fair Oaks - approximately a 17 to 21-mile commute, depending on whether he picks up his kids. Mike uses an app called Strava, popular in the bicycling community, allowing users to follow other cyclist’s rides with maps, speeds, and segments, and where cyclists can even compete for a segment's best time. Strava also serves as a social network for bikers. As a fitness trainer, I follow quite a few people on Strava, but Mike stood out to me as one of the most doggedly persistent lay-bikers I have come across. Not only does Mike map rides on Strava for the same route everyday, he also rides in all weather conditions - 100+ degree heat, amidst downpours of rain, and even during the recent storms. He consistently maintains an average speed of 20.5 mph, even with Downtown's stoplights and heavy commuting traffic. For his bike commutes alone, he has logged an average of 232 rides, and about 4,800 to 5,000+ miles a year since 2012. 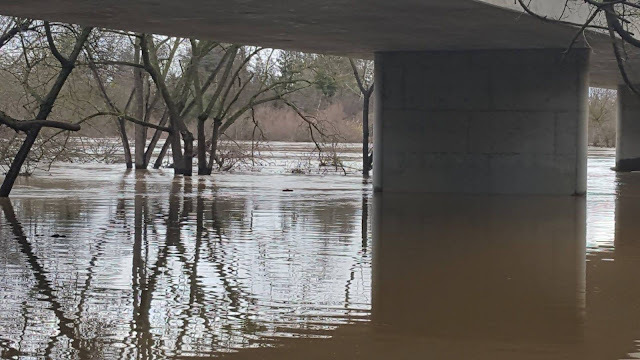 When all the recent heavy rains and floods were occurring, Mike was out on his regular commute, snapping pictures and carrying his bike over pools of water, then picking up his kids at daycare soaking wet, and trying to conceal his cold, wet body. 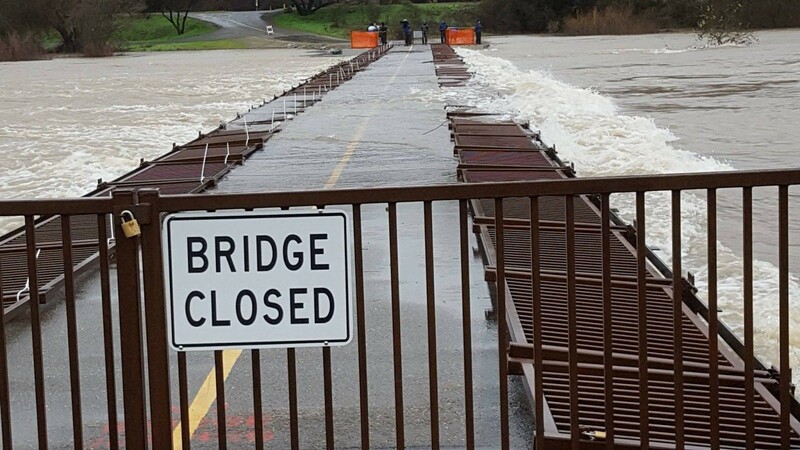 The pedestrian foot bridge near Sunrise Avenue during the recent heavy rains. These flood pictures were taken during his bike commute home. Below Howe Avenue, on the bike trail, taken during his commute. About a day later, the same location under the Howe Avenue on another commute. 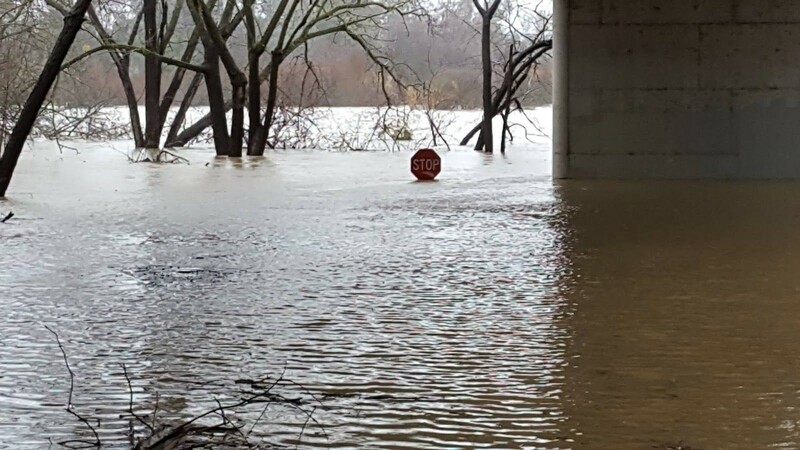 The stop sign is fully submerged. 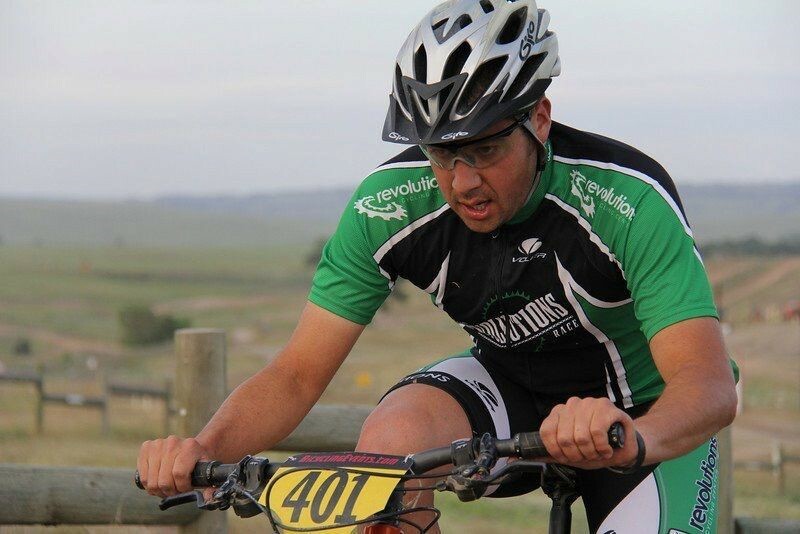 When he first started bicycling, Mike was racing mountain bikes and participating in "double centuries" - 200-mile organized bike ride, so he used his commute to keep up his weekly mileage, necessary to compete. He has been doing this for nine years now, and most of the riding he does is simply to maintain his fitness; fortunately, his commute time affords just that. Mike sees a significant difference in the way he feels too, as the ride home allows him time to unwind after being rooted at a desk for eight hours a day; still getting in his workout during what would normally be a car ride home for most. As well, on days when he rides, he definitely sleeps better. It takes about 45 to 50 minutes for his 17-mile route, and a bit over an hour for his 21-mile route. Since he rides fast, he has to watch carefully for both cars and squirrels, both major hazards to a cyclist, along with obvious other threats, such as someone opening a car door in traffic as he passes. Being a skilled cyclist helps to avoid the obvious perils of urban road biking. There are often times he doesn’t feel like riding, but he puts his music buds in his ears, and pushes through, then usually finds whatever it was that he was feeling is gone about halfway through the ride. What stops Mike from riding? Mostly wind. Recently, he had to give up his bike commute less than five miles into a ride and catch the train; he was giving it his all, but not getting very far. Riding against the wind would provide a great workout, but is not very productive if you have to pick up your kids at a certain time. Health issues have also be an obstacle. For Mike, it was both an emergency back surgery and an atrial fibrillation condition, the latter he has had since he was a teenager. He feels atrial fibrillation may have been brought on by the hard, competitive riding he did in the past. If he does need to exit quickly on a ride, the train ride home is a bit different when he gets off work around 15:00. At that time, the light rail is slightly younger, but rowdier; there is often loud music, yelling between passengers and the occasional fight. During these uncomfortable rides, he misses the beauty and peace of being on the bike, but is grateful for the option of being able to take the train, if necessary. Overall, Mike feels great about not contributing to traffic congestion, bad air quality, and mostly, getting his workout at a time when most commuters are stuck behind the wheel. He simply feels better when he bikes! So, no matter your age, Get out and Bike! Disclaimer: Placement or mention of commercial products, or referencing such enterprises, is in no way an endorsement for the product and/or company.